← Round 3 Hybrid, Days 88-90: Pure Cardio & Abs, Max Recovery, Cardio X & DONE! FINISHED! On December 23rd I completed my third round of P90X/Insanity-related stuff. 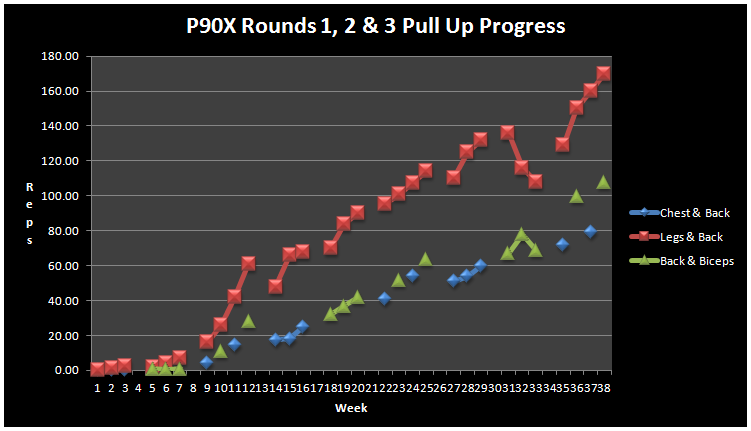 My first round started in January 2011 and was straight P90X Classic. My second and third rounds have both blended the Insanity workout regimen into the P90X schedule to amp up the cardio and plyometric routines. As always, this third round introduced new gains and setbacks as well as new toys and data to track. As far as setbacks, the dip in performance about one-third of the way through this third round show where I was struggling through an injury that prevented me from doing wide front pull ups. The gains returned when I decided to replace wide front pull ups with another type that didn’t aggravate the distal biceps tendon and/or brachioradialis muscle. The key was to modify what I needed to as I (hopefully) recover. And, to be honest, it was a bit of a slough to get through the final third of this round. I was getting both mentally and physically fatigued. So this recovery period and the holidays together are a welcome respite. I didn’t warm up or stretch before starting the hike. I got out of the car after a 2 hour drive in cold, damp weather with temperatures in the 30’s and just went, and at a pretty good clip. I hiked in running shoes that weren’t secured tightly. The result may have been excessive flopping around of my feet as I negotiated the irregular terrain. Overuse. Not just from the hike but the cumulative overuse from all the exercising and possibly tightening up of the band because I hadn’t done ANYTHING for about a week and a half between completing round 3 and stepping onto the trail for the hike. Age. Well, I suppose age is–and increasingly will be–a factor to some degree. It’s good, I guess, that this problem came up when it did as I’m taking it easy for another couple of weeks. This rest, plus some specific stretching/strengthening routines, will hopefully get me back on track and avoid the onset of an acute condition. A notable difference for me this round was that I purchased and used a Heart Rate Monitor. With this neat tool, I was able to capture calories and heart rate stats for all but the first few days of this round. 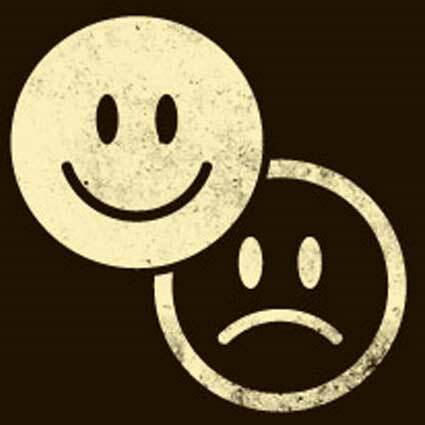 It is fascinating to see the relationship between how you’re feeling and your heart rate. Or the difference between a light, one hour 300 calorie workout and a 900 calorie purge. Over the course of the 90 days, I burned over 50,000 incremental calories while keeping my weight at or near 150 lbs. This means I averaged 639 calories/routine and 3,833 calories/week–the equivalent of 13.5 lbs of fat burn. What’s next? Well more rest and recovery (and stretching) for a couple of weeks. Then I expect I will do another round of this Hybrid beginning mid-month. Despite my whining, this Hybrid has produced teriffic results for me and I like the varity of the Insanity routines mixed in with P90X. Some have asked me about P90X2. I’m sure it’s a great program, but I feel I still have more to gain (and more investment depreciation to book) with these two routines. I’m toying with the idea of not recording any stats in my fourth round to try to just have more fun with it, not caring so much about weights and reps and so on. It’s a double edged sword, no doubt. The numbers cause obsession, but the obsessiveness helps yield the results. I have some time to ponder this more. In any event, I wish a happy and healthy New Year to all. And thanks to those who have visited my blog and given me support for this fitness effort. I hope those who stumble upon it find some utility in the information presented here, or at least get a chuckle from time to time. 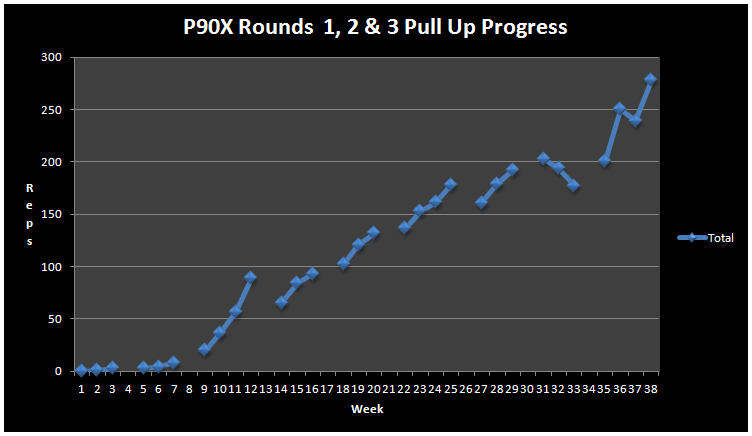 This entry was posted in Backpacking, P90X-Insanity Hybrid, Round 3 and tagged Calories, Heart Rate, Iliotibial band syndrome, Milestones, P90X-Insanity Hybrid, P90X-Insanity Hybrid Results, P90X-Insanity Hybrid Review, Pain, Pull Ups, results, Review, Reviews. Bookmark the permalink. Man oh man do I love your charts and graphs! I’m such a geek for the fitness data. I’ve been using the Wahoo + Digifit iCardio iPhone app for a few months to track heart rate while running and working out. They just launched a myDigifit site that has a few nice charts, although it’s still in beta. I just started P90X for the first time. I’m on day 18. I’d love to find a tool for creating the sorts for charts and graphs that you have. Would you mind sharing with me what you’re using? BTW, I saw your post on you walk up Sone Mtn. I live right next to it and can walk into a back bicycle path that intersects with my street. I’ve lived there for years but and have been walking off and at the park during that time. This summer when I decided I was going to loose the weight once and for all I started walking up the mountain at least once a week. It can be pretty brutal in the summer. But I love sense of accomplishment when getting to the top. I also started jogging this past summer and worked my way up to jogging all the way around the mountain (5 miles). There’s some nice trails for running on out there. And, yes, Stone Mountain is great fun. I don’t get over there enough. Thanks so very much! I really appreciate it. I can’t wait to start plugging in the data and viewing the charts. Congratulations, these are some impressive numbers and feats. Please post your schedule before you start your new round because I’d like to follow it too (simultaneously). You do an excellent job of motivating people and tracking data. On a side note, thanks for introducing me to Ayn Rand’s work. Happy new year. I will do that. Happy New Year to you, too.